Knowing that I was coming to Siggraph, I decided to pop for a portable MP3 player. I tend to stay at the Westin Bonaventure during conventions at the LA Convention Center, which is about a one mile walk – I find the walk a nice way to start and end my day at the conventions. And having my music along for the walk sounded even more pleasant. 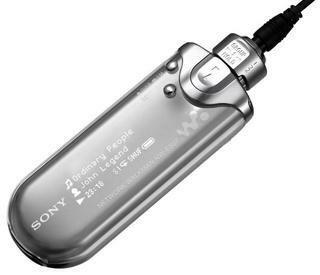 Sony recently came out with a cool little MP3 player with an OLED display – the NW-E507 – so I figured that must be the right one for me. 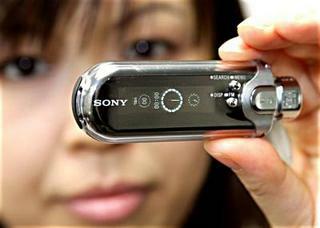 This little MP3 player has unbelieveable battery life. It’s a 1GB flash player, so no moving parts, which helps. But I’ve been using it about 2 hours a day (10 hours so far) and the battery indicator hasn’t budged yet. It recharges via a USB cable to an internal rechargable battery, which I also like – no extra power cables when traveling, and I nearly always have my laptop with me. The packed-in earbuds emphasize high frequencies, which at first I thought sucked. I have a pair of noise-cancelling earbuds that I use on planes, and they reproduce bass much better. However they cut off sound from the outside world and that’s not what I want when I’m walking through crosswalks. So I find that I’m using the simpler, packed-in earbuds on my walks. And the player’s little EQ helps a bit to boost the bass. The primary physical interface is the stem on top of the device, which has three positions: all the way down is “hold”, up one click is “song”, up two clicks is “album”. When in “song” or “album” position, you rotate the stem to the left or right to go to the next or previous song/album. There are also tiny volume buttons to either side of the stem. The PC software is unfortunately proprietary stuff which automatically converts my MP3’s to “OpenMG” format when transferring to the device, whatever the hell that is. I haven’t figured out yet whether I can copy raw MP3’s over, but that would certainly be much more ideal. At first glance, it looks like a funky screwdriver or drill. The way the headphone chord is truncated, I thought Sony had ventured into a new all-in-one MP3/power tool business model.